Ole Gunnar Solsjær collected his sixth straight victory in charge of Manchester United. The away side implemented a counterattacking strategy that aimed to make use of a dynamic attacking lineup. This created some promising transitions for United, including a glorious move that saw them take the lead on the stroke of half-time. Despite this, it took a fantastic David de Gea performance to keep out a dominant Spurs side and take all three points. Tottenham went into this game off the back of a midweek victory over London rivals Chelsea in the League Cup. Mauricio Pochettino made three changes from that match with Hugo Lloris playing in goal instead of second string keeper Paulo Gazzaniga. Danny Rose was replaced by Ben Davies at left back while Jan Vertonghen came in at center-back in place of Davinson Sánchez. Solskjær had won all five of his games in charge of Man United, with an FA Cup victory over Reading the latest triumph. The Norwegian coach made a whole string of changes from the FA Cup clash with the front three of Alexis Sánchez, Romelu Lukaku and Juan Mata replaced by the younger and faster trio of Anthony Martial, Jesse Lingard and Marcus Rashford. This was a hint of the counterattacking game plan that would be deployed. Mauricio Pochettino’s side found themselves controlling the ball for large parts of the first half and were able to use several buildup patterns in an attempt to break through United’s defense. They set up in the 4-3-1-2 / 4-4-2 diamond shape that has become a prominent part of their tactical identity this season. General team shapes when Tottenham were in possession. 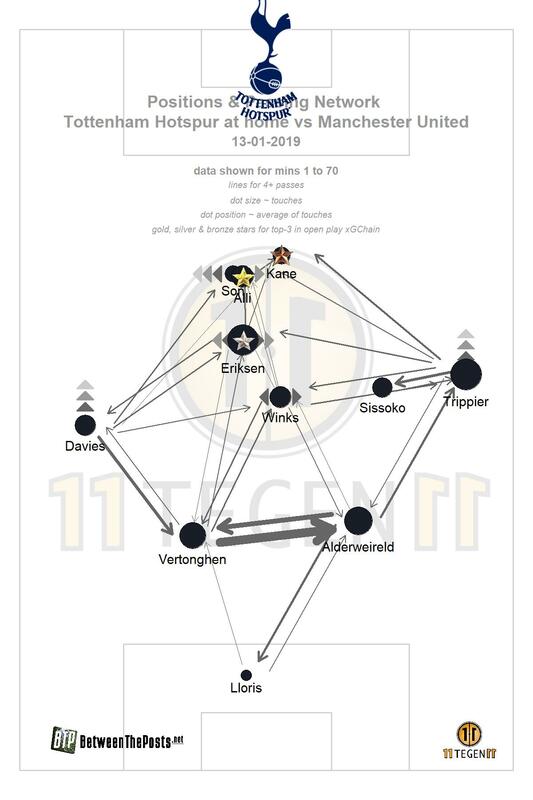 In the first phase of their buildup play, the center-backs would be supported by Harry Winks who offered a line breaking pass just behind United’s attacking line and Moussa Sissoko who would often drop to the outside of Toby Alderweireld. Christian Eriksen situationally dropped to show for a pass but also spent more time positioned higher up, either in line with or even behind United’s midfielders. The deeper position of Sissoko allowed the two fullbacks to take up advanced positions on both flanks and provide attacking width. United took up a 4-3-3 medium block A medium block refers to a team that retreats in their own half out of possession, generally only disrupting their opponents some way into their own half. when defending. The centrally positioned Lingard cut off the pass into Winks while the wingers alternated between cutting passing lanes into the fullbacks and staying narrow to protect the center. 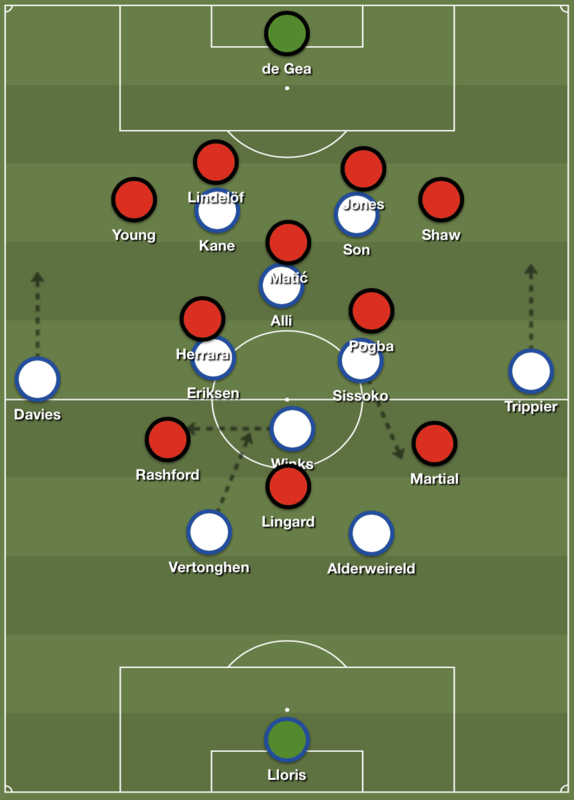 Winks would sometimes tilt his position off to the side, dragging Lingard out of position and allowing Vertonghen to step forward with the ball. From here, a combination of dropping midfielders and runs into depth gave the Belgian a plethora of options to progress the ball. As the ball moved up the pitch, the triangle of Dele Alli, Harry Kane and Son Heung-Min became key to how Tottenham found a breakthrough. Rotation of positions along with layoff passes and other combinations caused United to narrow their shape and block off the central threat, opening space for the ball to be circulated out to the fullback who was in space to cross. Well timed runs also offered a method of penetration as Kane and Son would drop deep and open space for Alli to run in behind. Son was the main outlet in transition, with his quick movement a good option for the first pass out of defense. A Son dribble followed by a through ball into the late run of Winks created one of Tottenham’s best chances of the half during a swift counterattack. It is worth mentioning, however, that United defended their box well and managed to keep clear chances to a minimum for much of the first half. United’s shape in possession was hard to precisely determine. 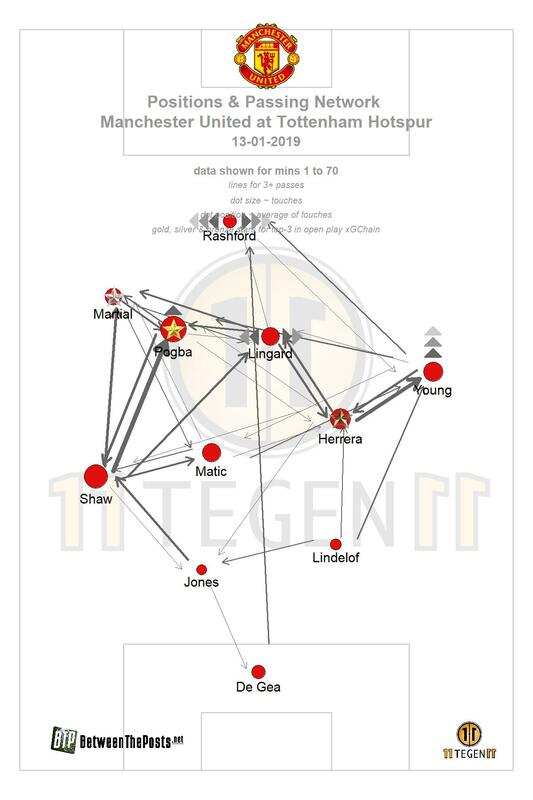 Sometimes Martial and Rashford would come narrow and Lingard would be slightly deeper, creating something that resembled a 4-4-2 diamond. Other times, Rashford and Martial split wide and it would be a clear 4-3-3. Other times, the advanced position of Pogba formed a sort of 4-2-3-1 shape. One thing was obvious though and this was Solsjær’s desire for horizontal compactness on the ball. The front three would often shift to the same side of the pitch, supported by the midfield and the fullback. This created more opportunities for combination play and nearside breakthroughs although this never really got going for the away side — partly a result of their opponent’s good pressing system. The above graphic shows one of the better examples of Tottenham’s pressing early in the first half. Their narrow defensive shape forced United to play out to Luke Shaw at fullback. Sissoko then shifted over to press while keeping Paul Pogba in his cover shadow. Son also dropped back to press from the other side and discourage a back pass. Every other passing option was blocked off and Shaw was forced into an aimless long ball up the line which Lloris came out to collect comfortably. United’s best chances came from counterattacks. The front three stayed high up the pitch for much of the defensive phase, including opposition corners, ready to spring forward and attack the space left by Tottenham’s expansive possession structure. The personnel on the pitch matched this game plan perfectly. Each of the front three had pace and ball-carrying skills while Pogba offered fantastic passing ability from midfield to release the forwards. These traits combined brilliantly in the 44th minute as an inch perfect pass from Pogba after a turnover found the feet of Rashford. He took the ball in his stride and calmly finished from a tight angle to put United in front going into the break. Sissoko had come off injured at the end of the first half and Érik Lamela had come on as a replacement. The substitute took up a role on the right wing at the start of the second half while Eriksen dropped to form a two man holding midfield with Winks. Son went to the left wing and Kane became the sole striker with Alli playing behind him as a number ten. Manchester United made some positional switches as well with Rashford moving to the center-forward role, Lingard shifting to right wing and Pogba becoming a number ten. Martial stayed on the left wing as Herrera and Nemanja Matić made up the newly formed double pivot. 4-2-3-1 is one of the most frequently occurring formations in football. The two most defensive midfielders are called a ‘double pivot’. This formed a 4-4-1-1 shape when out of possession. Tottenham’s change to a more familiar system had a clear impact on their effectiveness in possession. Eriksen’s occupation of deeper areas gave the home side more capacity to break United’s midfield line, behind which Alli and Lamela lurked in pockets of space — able to receive, combine and attack the defensive line. A segment of play in the first few minutes after the break perfectly encapsulated this newfound penetration. Eriksen picked up the ball behind the first pressing line, turned and pinged a pass to Lamela who was positioned between the lines. The Argentinean slipped it on to Alli who broke the final line with a through ball to Kane. It took a sturdy De Gea save to keep Spurs off the scoresheet. Furthermore, Son’s position wide left gave him the freedom to run at Ashley Young while Davies sat slightly deeper at left back. Kieran Trippier bombed up to support attacks from the right and provided a good source of crosses when the ball couldn’t be forced through centrally. Man United were able to create some dangerous attacks themselves, with Pogba providing an extra presence going forward, supporting the tight combination play on the wings and arriving in the box himself. 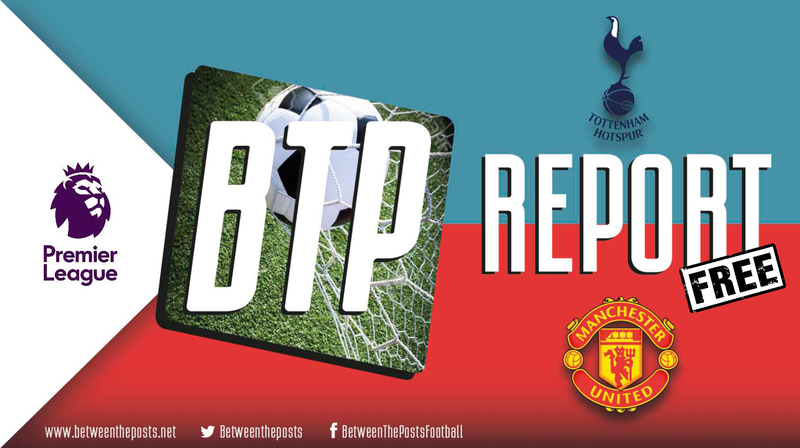 This only fuelled the fire at the other end of the pitch, however, as Tottenham’s forwards ran riot into the wide open spaces behind United’s midfield. 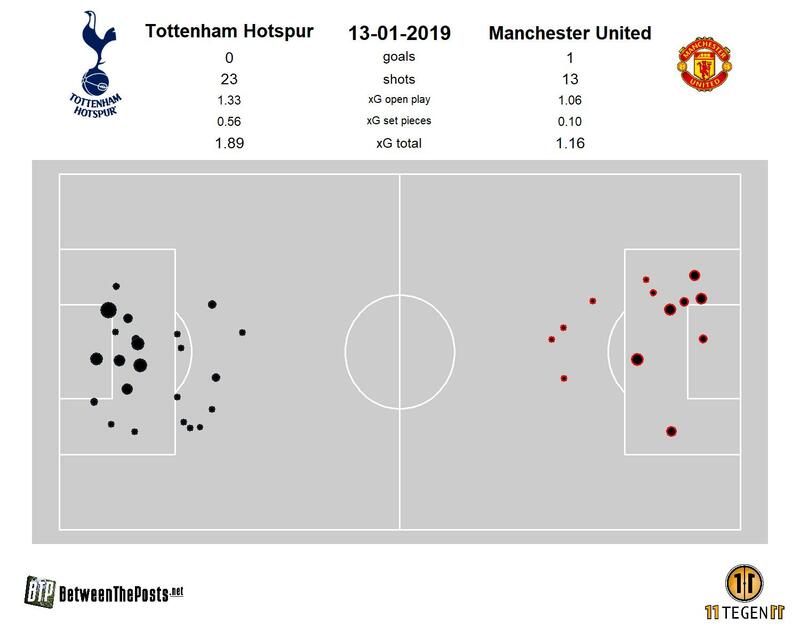 Adding to the list of Spurs’ offensive mechanisms, Kane’s tendency to drop deep and pick up the ball distorted United’s defensive lines and opened gaps for the likes of Alli and Lamela to attack. The striker also managed to get free of Phil Jones to get off a dangerous header from a corner, with Alderweireld similarly hitting the target from a set piece. That Tottenham did not find the back of the net throughout this period of dominance is nothing short of a miracle, with De Gea’s heroics in goal playing a massive part. As the clock ran down, Pochettino brought on Fernando Llorente in place of Harry Winks in the 81st minute, prompting a switch to a 4-4-2 formation. The substitute joined Kane up front as Alli joined Eriksen in central midfield. Son moved to the right wing and Lamela came to the left. The midfield four pushed up aggressively to support the two strikers high up the pitch while the fullbacks overlapped on both sides. Even the center-backs joined the attack from time to time. Solskjær reacted to the mounting pressure by bringing on Diogo Dalot, normally a fullback, for Lingard and Lukaku for Martial. This led to an even more defensive approach with long passes up to Lukaku the main outlet. The wingers would drop to the outside of the tucked-in fullbacks as United were penned in while Pogba dropped alongside the midfield two leaving only Lukaku up front. This formed a 6-3-1 formation during certain phases of play, a system José Mourinho had used when defending a lead. This return to the style of old saw out the victory — but in unconvincing fashion as Kane and Llorente linked up to good effect more than once. Tottenham gave more than a good account of themselves as they were the better team for much of the game, especially in the second half. United’s swiss cheese defensive system was exploited brilliantly with a mix of old and new tactics. In spite of the problems surrounding the club, it seems that Spurs can still deliver breathtaking football. 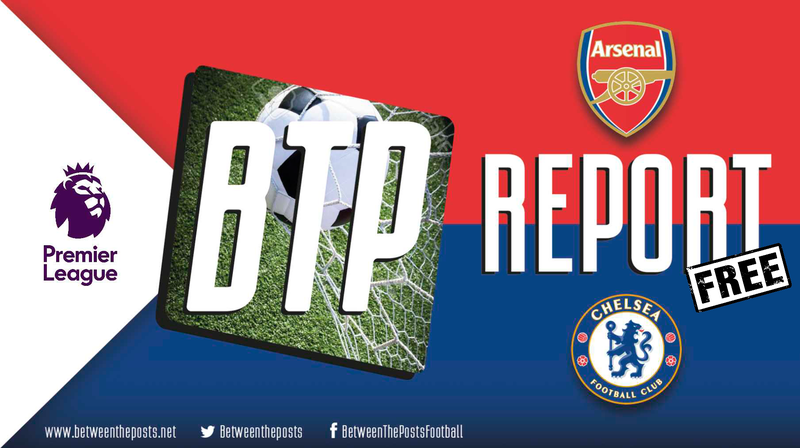 Results-wise, this was a damaging blow to their “title hopes”, but they never looked likely to challenge Liverpool or Man City in the first place. They are about where you would expect on the table and look likely to cruise to a top four spot. Solskjær’s sixth straight victory will only solidify the narrative surrounding a supposed Manchester United renaissance. But this game does not really tell us anything about United that we did not already know. Their manager’s proactive philosophy has allowed their stellar attacking talent to wreak havoc on opposition while they lack stability at the back with De Gea holding up a creaking backline. Pretty much the same as it has ever been. If you like this article, please consider a membership of Between the Posts. 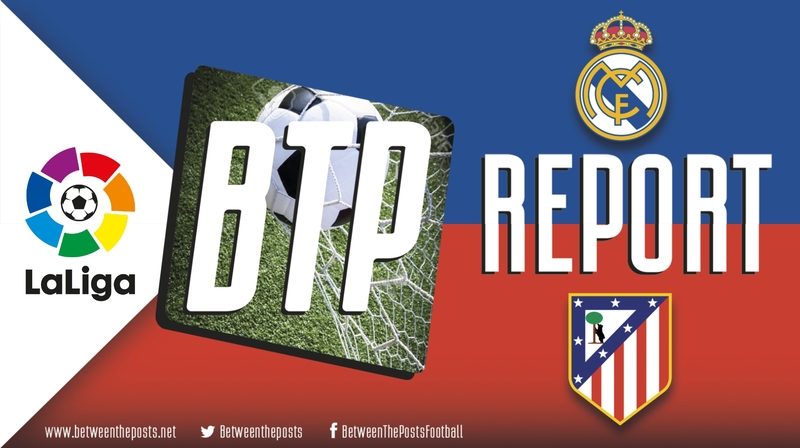 This will grant you access to all our coverage of the top five leagues, plus our advanced team stats page.